A delicious dry processed natural coffee from Cedral de Aserri, Costa Rica. The Los Lobos farm is owned by brothers Luis and Jim Alfaro who are third generation farmers and is located in the center Costa Rica between the Acerri and Acosta regions. They placed in the 2008 and 2011 Cup of Excellence in Costa Rica and as a result of their commitment to quality. 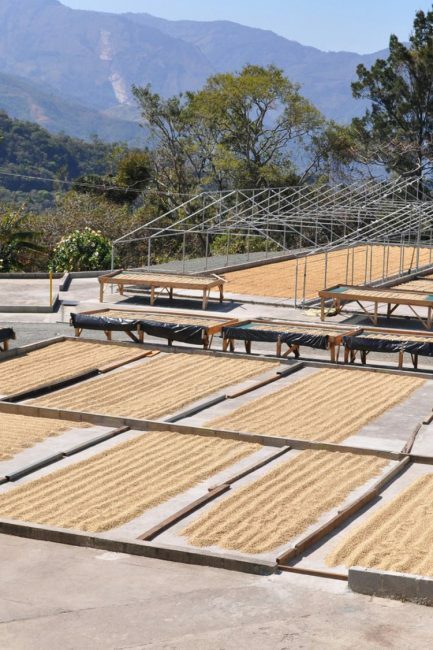 After a meticulous hand picking process, the coffee cherries are rinsed and carefully placed in thin layers onto raised beds. They slowly dry over a three week process which causes the yeasts present under the skin of the cherry to ferment the mucilage(flesh of the fruit) adding to the very distinctive winey notes present in this fine coffee. This natural coffee begins with an aroma of hazelnuts followed by watermelon. In the cup bursts with notes of vanilla, peach, plum, and raisins with a full body. Los Lobos is available from our brew bar in various pour over forms. We recommend V60. You can also buy Los Lobos in 225g in THE STORE by Seven Wonders located in CHQ.